Tire pressure entails a serious risk of explosion, the highly powerful tire machines impose danger, and working with tires also features a number of other health risks. The tires have increased in terms of size and mass and, consequently, the tire pressures have also risen. Professional tire-industry employees handle an increasing number of tires featuring different sizes and technical properties every day. The most important thing is to recognise risks in advance and act efficiently to control them. 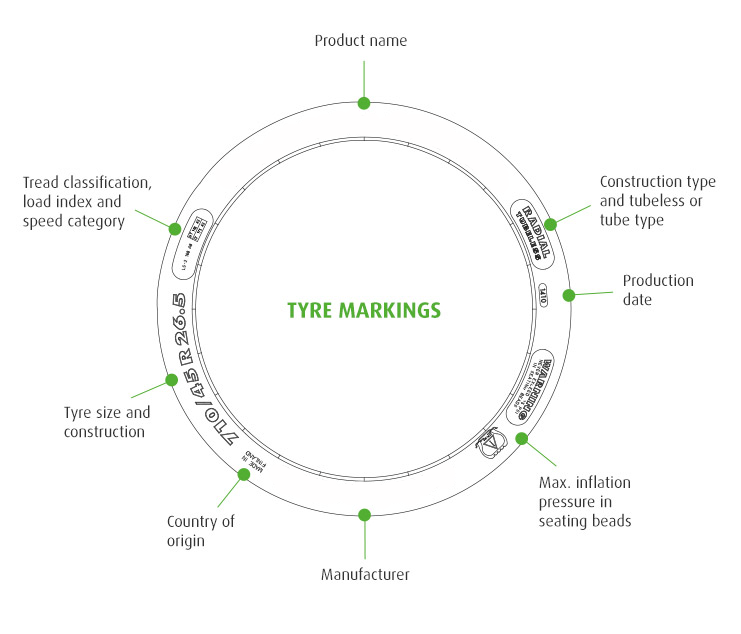 The basic tyre markings are outlined in tyre norms. In addition, tyres contain specific safety markings, such as the maximum pressure for seating on the rim and the maximum inflation pressure. In case of uncertainty of a tyre's suitability for a certain purpose, and any unclear situations, the tyre manufacturer should be consulted. The maximum pressure for seating on the rim should also always be verified. If the tyre is not properly seated on the rim, dismount the combination and find out the cause of the problem. When should you discard a tyre? You must discard tyres with defects of such extent that they may impair the tyre structure or pressure endurance, e.g. defects in the body plies or belts. A nationwide system of tyre safety card training has been established in Finland in order to improve the safety of tyre operations. The main goal of this training is to increase awareness of the risks and responsibilities related to tyre operations, and to provide guidance in using the right, safe work methods. The training particularly focuses on the risks related to mounting large, machine-category tyres. Mechanics who successfully pass the training receive a tyre safety card that remains valid for five years. The tyre safety card has proven to be surprisingly popular. One in four tyre-industry mechanics have already acquired the card. It is the only industry-specific occupational safety pass. The impact of the tyre safety card can be seen at workplaces in the form of improvements in the general safety culture. In addition to the general safety instructions, the country-specific rules and regulations issued by the site, employer and local authorities must be observed. Heavy tyres are mounted in various conditions. Usually, the mounting is done by specialised companies, but sometimes tyre handling is necessary even in the middle of work, for example, in the forest. Mounting the wheel on the machine or vehicle. Every phase includes specific safety points. A key safety factor is the inflation pressure. Wheels should always be dismounted and handled in a depressurised form. A safety cage should always be used when pressurising tyres, both new and defective, in order to find the defective areas. Protective cages suitable for the handling of large machine tyres are not always available. In such cases, a sufficient safety distance must always be observed. SAFETY EQUIPMENT IS NOT USED OR SAFETY INSTRUCTIONS ARE NOT OBSERVED. INSTRUCTIONS AND GUIDANCE PROVIDED ARE INSUFFICIENT. WHEN INFLATING A TYRE, PEOPLE ARE IN THE DANGER ZONE IN THE PROXIMITY OF THE TYRE, AND THE SEATING OF RIM COMPONENTS IS NOT CONTROLLED. THE MACHINE IS NOT SUPPORTED SUFFICIENTLY, THE TOOLS ARE NOT APPROPRIATE. THE TYRE HAS INNER OR STRUCTURAL DEFECTS THAT WILL CAUSE IT TO EXPLODE AT SOME STAGE OF THE TYRE OPERATION.